The Jacksonville Jaguars entered the 2018 season with high hopes, but a struggling offense and regressing defense led to a 5-11 record and last-place finish in the AFC South. 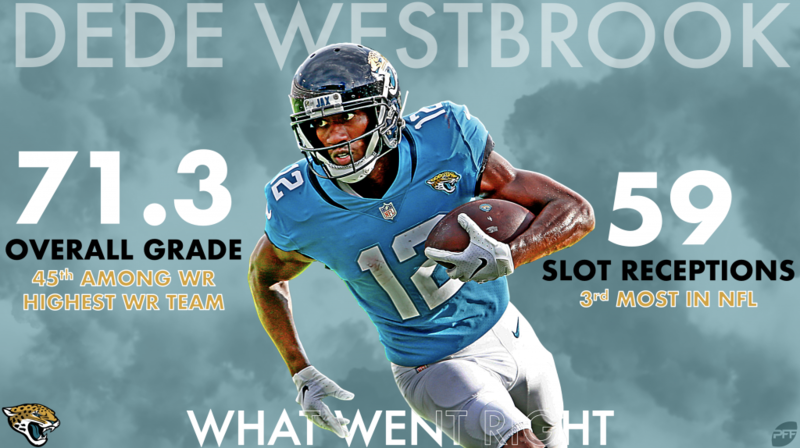 Dede Westbrook proved he could be a durable all-around WR, despite shaky quarterback play. He had the top grade among the Jaguars’ pass catchers at 71.3. 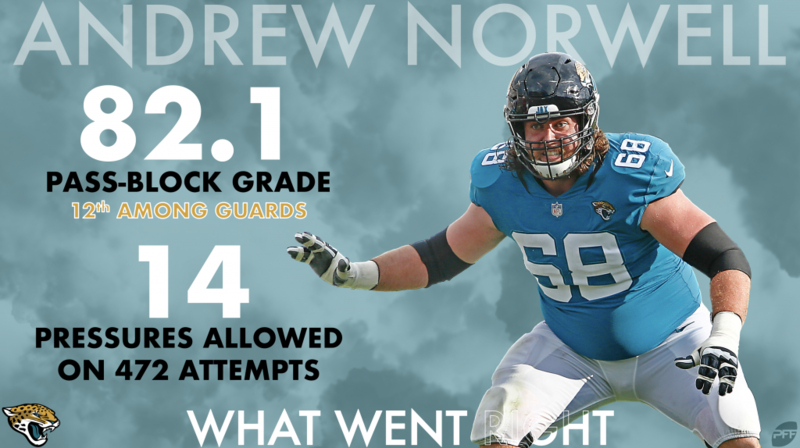 Andrew Norwell was a solid offseason addition, finishing 12th among guards with an 82.1 pass-blocking grade. He allowed only 14 pressures on 472 attempts this season. 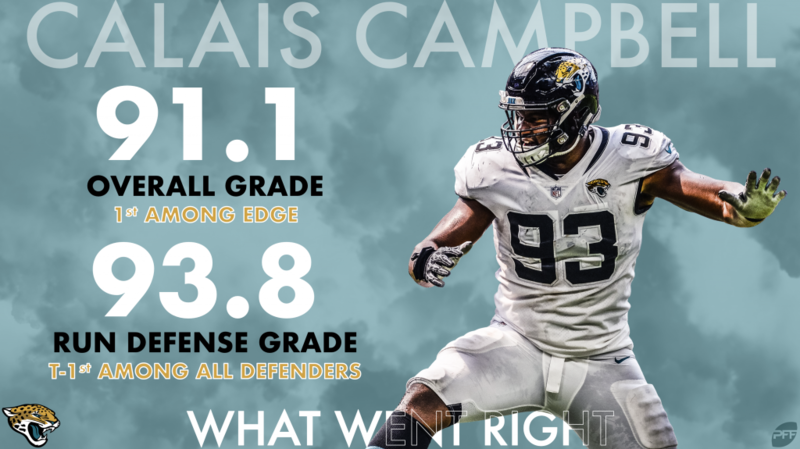 Calais Campbell finished as the NFL’s highest-graded edge defender and put forth a ridiculous 93.8 run-defense grade that tied Damon Harrison for the best at any position on defense. Cornerbacks A.J. Bouye and Jalen Ramsey allowed just two combined touchdowns while intercepting four passes and breaking up 15 more. 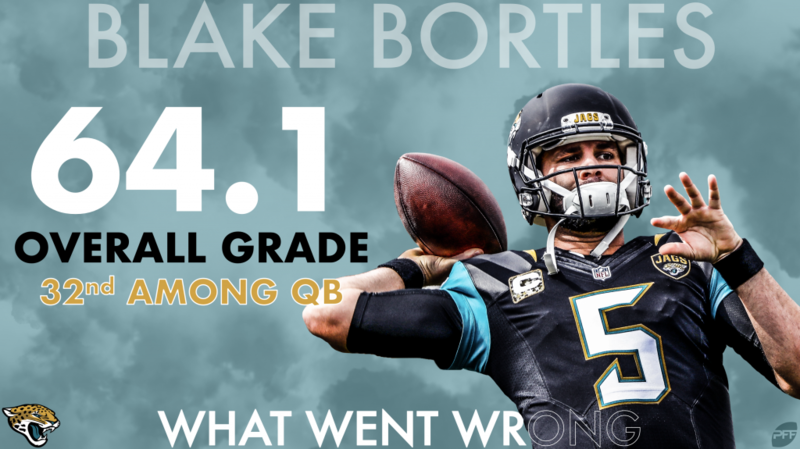 Blake Bortles took a step back with a 64.1 overall grade that ranked 32nd among NFL quarterbacks. He was benched at one point in a season in which the Jaguars started the season with Super Bowl hopes and finished with a Top-10 pick. 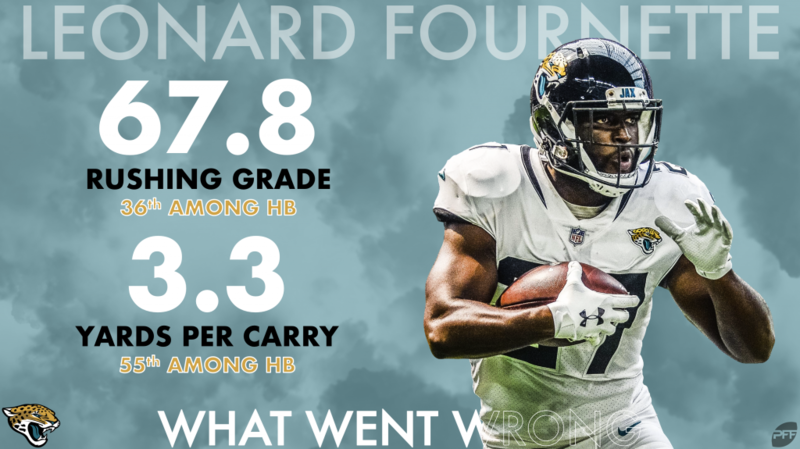 Leonard Fournette battled injuries and managed to average just 3.3 yards per carry. His 67.8 rushing grade ranked just 36th among running backs. 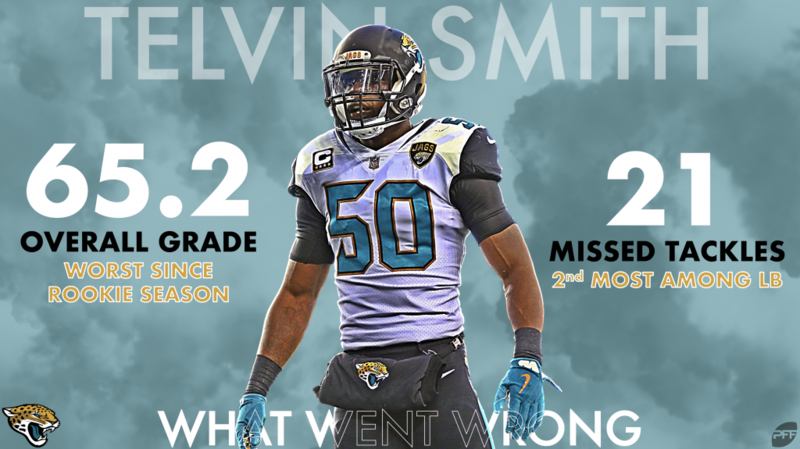 Telvin Smith took a step back to grade at 65.2, his worst mark since his rookie season of 2014. Smith missed 21 tackles while grading at just 65.2 in coverage. Ramsey took a step back from his elite 2017 season, allowing the 10th-most yards in coverage among CBs. Center Brandon Linder posted the highest grade on the offensive side of the ball at 74.4, good for fifth-best among the league’s centers. He allowed just seven pressures on 374 pass-blocking attempts. Campbell had the top grade on the defense, as he dominated in the run game and led all edge defenders with 56 stops to go with 53 total pressures. 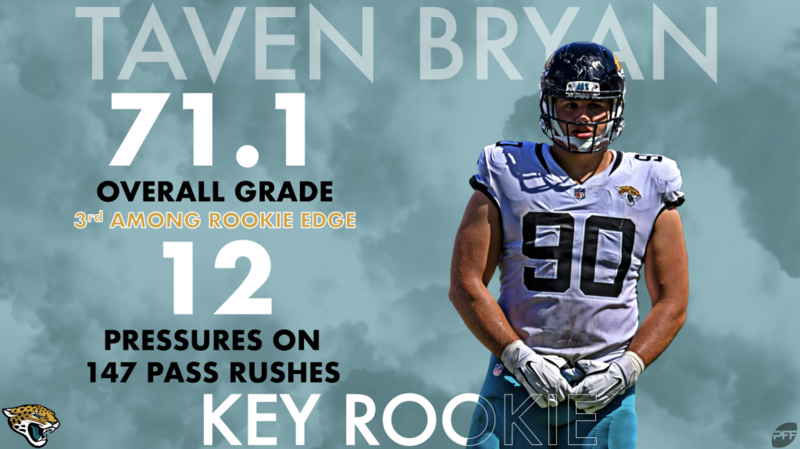 The Jaguars didn’t get much from their rookie class, but first-rounder Taven Bryan had a solid showing with a 71.1 overall grade on his 301 snaps. Bryan picked up 12 pressures on 147 pass rushes. It was a disappointing season for the Jaguars in 2018, but there’s still plenty of defensive talent to bounce back in 2019 as long as the offense gets an influx of playmakers and a more stable quarterback situation.